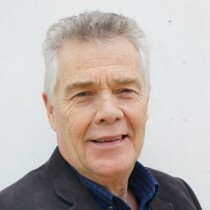 It is 11 years since he started doing Strictly and in that time he has gone from being an unknown Australian dancer-choreographer to being one of British TV’s most familiar faces – loved and loathed in equal measure, I suspect – as well as a successful director of musical theatre; his UK tour of Fiddler on the Roof two years ago, with Paul Michael Glaser, was described by The Stage as “triumphant”. Having come from a musical theatre and cabaret background – he did a solo drag act called Lavish back in Sydney for a number of years – he had doubts at first about his ability to judge ballroom dancing. 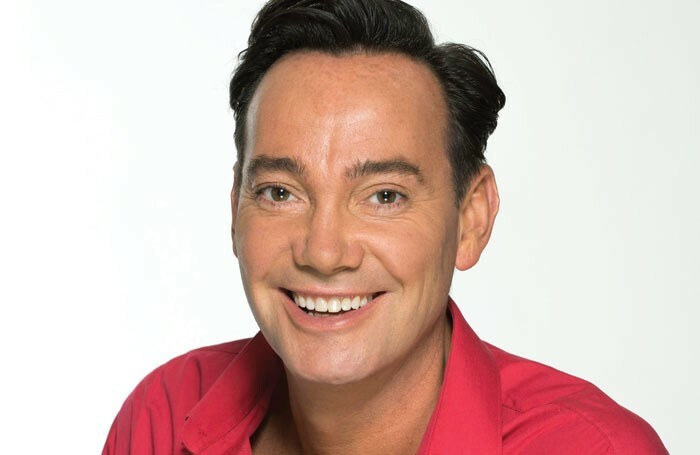 A British citizen since 2011, there is no doubt that Revel Horwood’s Strictly profile has helped his career as a choreographer, director and panto star. In addition to Fiddler, he has directed revivals of The Hot Mikado, Spend, Spend, Spend, Sunset Boulevard, Martin Guerre, Copacabana, Sweet Charity, and others. He works like a man possessed, and says he is booked up three years ahead. 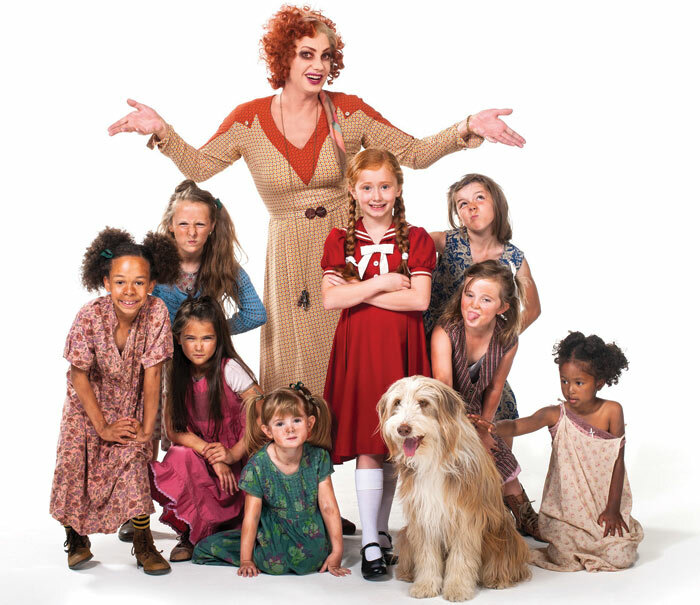 Right now he is embarking on a five-month tour of the musical Annie – not as director or choreographer, as you might expect, but in the role of Miss Hannigan, the drunken, raddled orphanage keeper with a pathological hatred of children. If his Wicked Queen in Snow White and the Seven Dwarfs was a crowd displeaser, Miss Hannigan is twice as repellent. Luckily for the actors and dancers he employs in his musicals, Revel Horwood does not extend his taste for malevolence to his work as director and choreographer. However you’d be forgiven for surmising that a Revel Horwood audition is an experience to be feared rather than enjoyed. Now that he is a respected director himself, is he good at taking direction from others? 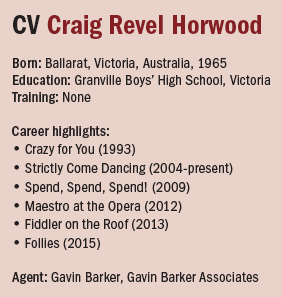 Strictly aside, the big career change for Revel Horwood was appearing in Crazy for You in the West End in 1993, in which he was dance captain. 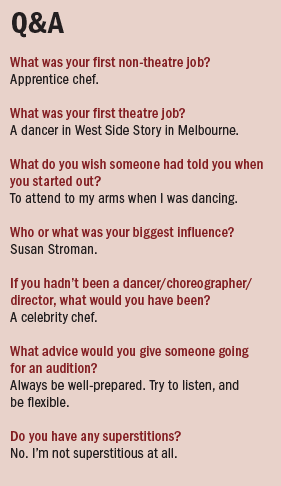 On that show he met the director-choreographer Susan Stroman, who was to have a huge influence on the direction of his career. “She had worked with Bob Fosse, who was my hero. She helped me a lot, and encouraged me to drop everything and go for it. “Choreography isn’t just about the steps, it’s about how you tell the story and how the step is viewed. Every show is different. For instance, Spend, Spend, Spend had to be very earthy and based around Viv Nicholson’s body language. When Strictly returns to our screens in October, Revel Horwood will share the role of Miss Hannigan with the diminutive Lesley Joseph, but only on Saturday nights when the TV show is broadcast live. As soon as the tour of Annie finishes in November, he will go into rehearsals for Peter Pan, playing Captain Hook at the Wycombe Swan. As soon as the panto finishes, he will begin rehearsals for the live UK tour of Strictly, which will take him into February 2016. To we ordinary mortals, the schedule sounds relentless. But to Revel Horwood, who turned 50 earlier this year, it’s only half the story. As for being recognised everywhere he goes as Strictly’s Mr Nasty – the tabloids dubbed him Craig Revel Horrid – he says it doesn’t bother him any more.